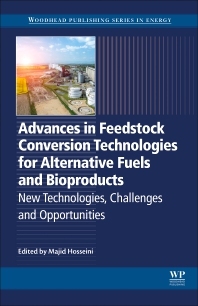 Advances in Feedstock Conversion Technologies for Alternative Fuels and Bioproducts: New Technologies, Challenges and Opportunities highlights the novel applications of, and new methodologies for, the advancement of biological, biochemical, thermochemical and chemical conversion systems that are required for biofuels production. The book addresses the environmental impact of value added bio-products and agricultural modernization, along with the risk assessment of industrial scaling. The book also stresses the urgency in finding creative, efficient and sustainable solutions for environmentally conscious biofuels, while underlining pertinent technical, environmental, economic, regulatory and social issues. Users will find a basis for technology assessments, current research capability, progress, and advances, as well as the challenges associated with biofuels at an industrial scale, with insights towards forthcoming developments in the industry. Dr. Majid Hosseini has earned both his Ph.D. and M.S. degrees in Chemical Engineering from The University of Akron in Ohio, United States, while also holding a professional certificate in Innovation and Technology from Massachusetts Institute of Technology in Massachusetts, United States. He has also completed an MSE degree in Manufacturing Engineering at UTRGV in Texas, United States and a Bachelor’s degree in Chemical Engineering at Sharif University of Technology in Tehran, Iran. Dr. Hosseini is the editor of multiple high caliber books, has published several peer reviewed research articles and book chapters, and has co-invented patents application technologies. He has served as a key speaker at multiple international conferences and has been actively engaged in technology development. In recognition of his contributions to science and service, he has received several awards and certificate of recognitions. Dr. Hosseini’s research interests, expertise, and experiences are diverse, ranging from biofuels and bioenergy, bioprocess engineering and development, industrial biotechnology, and sustainability to smart bio/nanomaterials, smart polymers and coatings, nanoparticles, and bio/nanotechnology.